Rabbit Air, an American-based air purifier company, calls Los Angeles, California home. They hit the market back in 2004 with their sights set on creating an innovative product to clean indoor air as efficiently as possible. Since then, Rabbit Air made its mark on the industry, becoming one of the top companies, manufacturing a variety of high quality and affordable air purifiers. Their products also include a wide range of customizable air filters to accompany their purifiers. Ultimately, Rabbit Air prides itself on air purifying excellence and top notch customer service. All Rabbit Air Purifiers are equipped with a 4-6 stage filter including at least a pre-filter, a HEPA filter and a charcoal-based activated carbon filter. These filters are the keystone to Rabbit Air purifiers and are meant to fully purify and deodorize your air. Some models also come with 2 additional filter options: a medium filter and a customized filter. The purpose of a pre-filter is to collect and minimize the larger pollutants in your environment. Large particles, allergens and dust mites are trapped while going through this first filter, eliminating the biggest problems right off the bat. HEPA (High Efficiency Particulate Arresting) filters are considered one of the most effective type of filters for air purification. Air is forced through mesh fibers which catch the unwanted particles. Rabbit Air’s version, the BioGS HEPA filter, captures 99.97 percent of airborne particles 0.3 microns and larger. It effectively reduces allergens and contaminants as the second stage of their filter system. Charcoal-Based Activated Carbon filters use a process called adsorption to trap pollutants inside the carbon pore structure. These filters are made of “high-grade granular activated carbon” and are good at removing chemicals and odors from your home. Greenhouse gases, cooking odors, and tobacco smoke are just a few of the pollutants that Rabbit Air’s third stage filter can process. A Negative Ion Generator takes care of the last stage of filtering. The Rabbit Air medium filter is the fifth wave option in the filter system. It is specifically good for trapping pollutants like pollen, mold, dust and pet dander. This filter traps particles larger than 1 micron. It is another effective way of getting rid of as many airborne pollutants in your home as possible. The most unique filter that Rabbit Air has to offer is the Customized filter. This option allows you to personalize and customize your machine to fulfill the specific needs of your home. You can choose between a Germ Defense, Pet Allergy, Odor Remover, or Toxin Absorber. The Germ Defense specializes in eliminating bacteria and virus particles. The Toxin Absorber helps to reduce volatile organic compounds (VOCs). People with pets in their home will want to consider the Pet Allergy option to get rid of excessive dander. Finally, an additional Odor Remover will eliminate the worst scents lingering in your home. Negative ions assist air filters by attaching themselves to airborne particles. These particles then struggle to remain aloft, making it easier for the air filter to capture them. In addition to making air filtration even more effective, negative ions have been studied and found to lighten depression and improve mental energy. The one downside is that ozone is often a byproduct of negative ion generators. Fortunately, Rabbit Air machines emit very negligible amounts of ozone. The BioGS 2.0 gives off 0.001 ppm (parts-per-million) when the negative ion generator is turned off and the MinusA2 emits zero ozone. When using the lowest settings, these machines emit 25-50% less ozone than the California Air Resource Board sets as its safety standard. 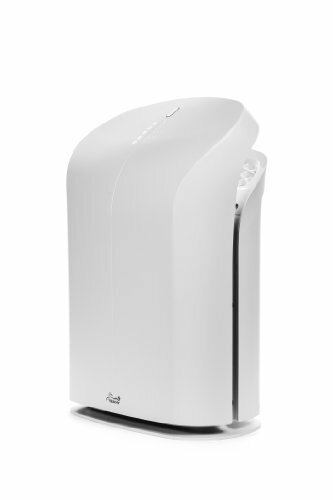 Rabbit Air has two main models which make up their air purifier line: The BioGS 2.0 and the MinusA2. Both of these machines have multiple filters, a sleek design and are known for their “whisper quiet” technology. Rabbit Air markets their “holistic approach”, creating an air purifying system that will blend in with its environment. Rabbit Air designs and engineers their machines to efficiently rid your home of airborne pollutants and odors. The BioGS 2.0 has an award winning design created by industrial designer Guto Indio da Costa. It won both the Good Design and the Red Dot award in 2014. Many consumers prize the BioGS 2.0 for its whisper-quiet technology which is the result of its internal Brushless Direct Current Motor (BLDC). This motor includes 5 different speed options and is practically silent on the lowest setting. The BioGS 2.0 can filter the air of a room up to 550 square feet. The ACPH (Air Changes Per Hour) quantifies how many times per hour a room can be cleaned. The BioGS 2.0 manages this feat two times per hour. As part of its 4-stage filter system, the BioGS 2.0 uses both a HEPA and a charcoal-based activated carbon filter. Its CADR (Clean Air Delivery Rate) rating is 162 for pollen, 149 for dust and 135 for Smoke. It is a relatively small machine with dimensions measuring 22.2 inches high by 16.6 inches wide by 9.8 deep and is only available in white.The BioGS 2.0 also provides a smart display which will light up when needed or power down to conserve energy. It has a filter life indicator which will alert you when it’s time to replace the filter. Finally, the BioGS 2.0 has auto air quality monitoring that adjusts the fan speed based on the amount of pollutants it detects in the air. Clean air of room up to 550 sq. ft. The BioGS 2.0 Spa-625A has all the same features as the 550A but with a few minor improvements. The Spa-625A has the same dimensions as the original model but can purify the air of a larger room up to 625 sq. ft. Because of this, it is slightly more expensive than the 550A but also has a higher CADR rating: 189 for pollen, 165 for dust and 152 for smoke. This machine has more power than the original model and so is perfect for homes with larger rooms or more potent allergies. Clean air of room up to 625 sq. ft. The Rabbit Air MinusA2 line offers a wider range of filter and design options while still maintaining the quality and efficiency of all Rabbit Air purifiers. The classic machine provides two base color choices, either white or black, and measures 20″ high x 21.4″ wide x 7″ deep. The MinusA2 features a flat, sleek design that can either stand independently or be mounted on to a wall. It is equipped with a light sensing auto mode and a mood light. The light sensing auto mode will recognize a dark room and automatically go into sleep mode. The mood light will display an array of colors meant to soothe and relax. The purifier is also available with customized panels to live comfortably in almost any decor. In addition to the range of customized options, the MinusA2 has many technical achievements. It will filter the air of a room up to 700 sq. ft. and has an ACPH of 2 times per hour. This model also has auto air quality monitoring and a filter life indicator. The MinusA2 has a 6-stage filter system which not only includes the HEPA and charcoal-based filters but the Medium and Customized filter options as well. With this machine, you can choose between the Germ Defense, Pet Allergy, Odor Remover, or Toxin Absorber filters. Due to this, the CADR rating is 201 for pollen, 200 for dust and 193 for smoke. This is a wonderful option for people suffering from specific allergies. Clean air of room up to 700 sq. ft.
Once again, the MinusA2 Stylized Spa-780 has all the features of the original model but with an added bonus. This machine is slightly more powerful and has even more customizable options. It can filter the air of a room up to 815 square feet and therefore has a CADR rating of 208 for pollen, 200 for dust and 193 for smoke. 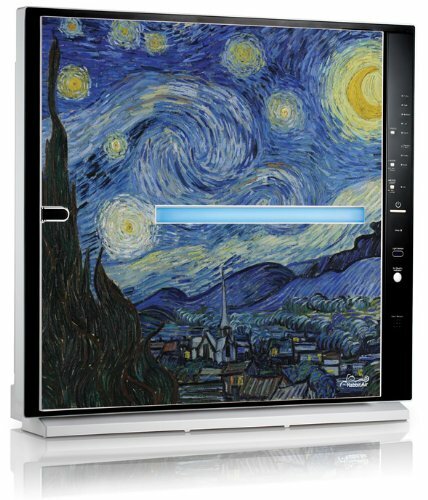 Most uniquely, it offers a wide range of style options to add color and novelty to your machine. You can choose from a variety of patterns from artists including Gustav Klimt, Katsushika Hokusai and Nanami Cowdroy. Not only can this machine easily fit along or even on the wall, but it blends perfectly into whatever your home decor may be. There are even designs for kids! Clean air of room up to 815 sq. ft.
As you can see from the chart below, Rabbit Air has some significant competition. They do offer a lot of value, but your decision will typically depend on purifier style, features, and value. For slightly less cash than the BioGS you can get some pretty great purifiers. The lowest price purifier, the Coway AP-1512HH, is significantly cheaper to buy and operate. However, the coverage is significantly less impressive. Moving up in price, the Blue Pure 121 and 211+ offer pretty similar performance at a better price point. If we were considering the BioGS 2.0 the Blue Pure models would top the list of other purifiers to compare. The Austin Air Healthmate Jr. would also be a good option, though the price is slightly higher. It offers vastly different benefits than the BioGS, so we wouldn’t necessarily consider it unless raw purifier power was a key consideration. The Healthmate is much less refined (it’s loud, and not that pretty). But, it is much more effective if odor removal is a priority. If you’re considering the 700A, 780A, or 780N you’ll find that they offer a lot of value for the money. Similar purifiers are slightly more expensive. The standard Healthmate is the next most expensive purifier, but like the smaller Healthmate JR… it is pretty primitive. It doesn’t have the looks or ultra low noise level of the MinusA2 line, but it is a powerhouse. If you have a large space or need a lot of air changes per hour or odor removal, it’s hard to beat the Austin Air. In all honesty though the two purifiers are different enough that we wouldn’t say one is better than the other. They have completely different features and quirks. The real competitor to the 700A and 780A is Alen’s Breathesmart Fit-50. It’s good looking and offers a similar set of features and placement options. If you the MinusA2 models are on your radar… you need to check out Alen. Also be sure to check out AirMega’s 300 and 400 models. The street price is comparable and they offer great looks and way more performance. Finally, if you’re in search of a solid smart purifier like the BioGS 2.0 780A, you really should check the price on the Airmega 300s and 400s. They provide great app support for Android and iOS (better actually), and they are absolute powerhouses compared to the 780A. The main thing that would make us choose the 780A over the AirMega’s would be purifier placement. The AirMega’s are HUGE, while the 780A is sleek with a very small footprint. And, don’t forget… the MinusA2 is wall-mountable. That’s a big plus in the 780A vs AirMega debate. Bottom line, any of the Rabbit Air Purifiers will meet or exceed your expectations. However, the competition is stiff in this price bracket so you’ll definitely want to look into the competitors we listed. You might find one that better meets your individual needs. Rabbit Air believes that clean air is key to a healthy lifestyle. And, they are determined to educate consumers. They offer a wide variety of information and resources for choosing and maintaining the best air purifier for you. 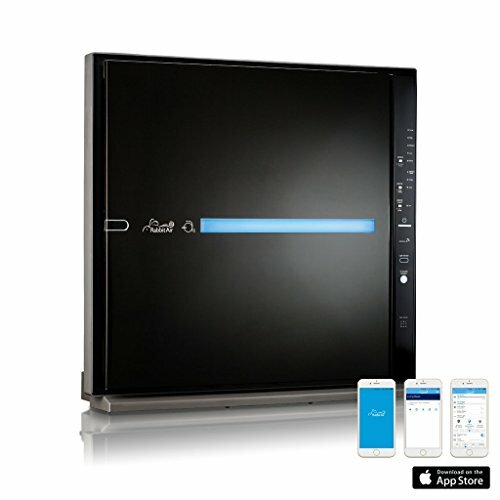 Rabbit Air will help you find an air purifier that will perfectly suit your needs – just like PureAirSupply.com. They will even suggest competing brands if none of their options fit the bill. In addition to air purifying knowledge, Rabbit Air provides exceptional customer support. Consultants are available to address your needs 24/7 via phone or email. Rabbit Air also backs machine purchased with a 90-Day money back guarantee. As long as the machine is returned in “like new” condition, the consumer will receive a full refund if they are unhappy with the device. More importantly, Rabbit Air purifiers come with a 5-year warranty. Rabbit claims that there is no hidden fine print in their warranty, unlike other brands which may only guarantee certain parts of the machine or require consistent customer maintenance. Aside from the slightly higher price point, Rabbit Air Purifiers have a lot to offer. We think they’re a great value and you really get what you pay for. They are unobtrusive with a variety of customizable design options. They include some of the most efficient filter options on the market and maintain strong CADR ratings with negligible ozone emission. Most people enjoy the fact that these air purifiers are some of the quietest models around so can be easily placed in any room of the house or office. While you may not need artistic designs on your air purifier, it makes a nice touch. If you are willing to invest in a top quality machine with top notch customer service, Rabbit Air is a great choice. When other sites publish rabbit air reviews they tend to focus on generic information about purifiers in general. We think they tend to gloss over some of the things Rabbit Air does really, really well. For example most Rabbit Air reviews fail to mention that their purifiers carry the AAFA’s Certified asthma & allergy friendly® seal of approval. That’s huge! There aren’t many certified asthma and allergy certified purifiers out there. Another thing other Rabbit Air Purifier Reviews tend to miss, is the wall mount feature offered by the MinusA2. This is ultra rare in the plug in purifier market. If you’re short on space, this is an excellent option. Especially if you’re a cigar lover… mounting the purifier high on the wall makes a lot of sense. We all know that smoke rises, right?